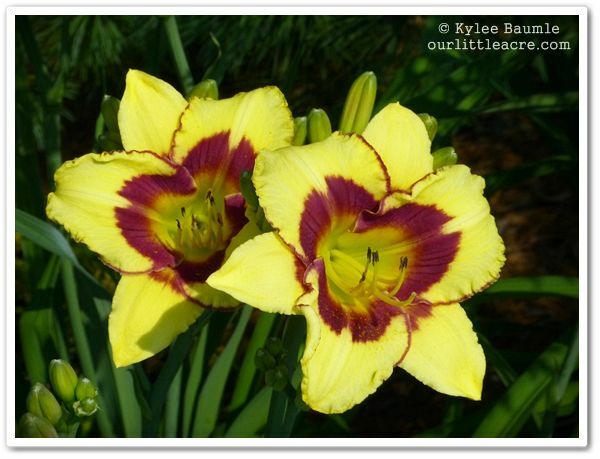 This time of year makes me glad that I grow daylilies for a number of reasons. There are literally thousands of different ones to choose from and just when I think I've got enough, another one catches my eye. This year, it was Proven Winners' 'Primal Scream' that jumped into my cart as I was doing some shopping earlier at Garden Crossings. 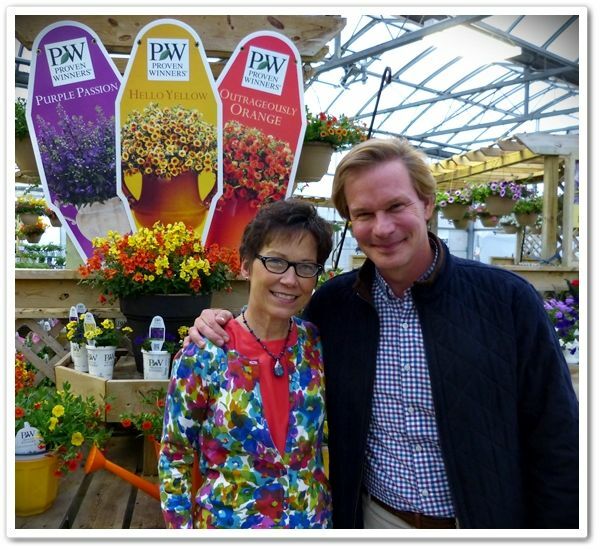 This garden center in Zeeland, Michigan, held an open house party the night before the Proven Winners Outdoor Living Extravaganza in April and P. Allen Smith made an appearance there. Garden Crossings is an outstanding example of what a great independent garden center should be. With a wide variety of perennials and annuals to choose from, as well as a fair number of shrubs, vegetables and tropicals, the store is about the most immaculate one I've ever been in and the displays are just gorgeous. 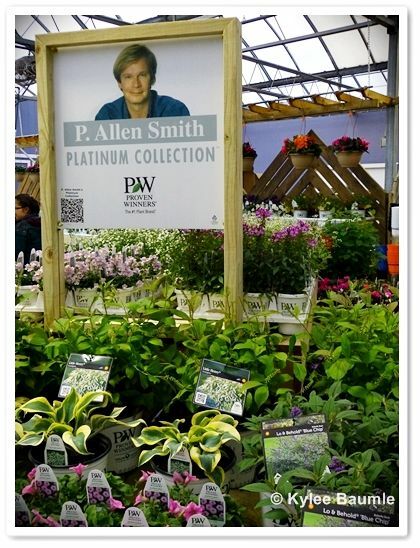 They're well-labeled with plant information and owners Heidi and Rod Grasman are ever so helpful with their knowledge of what they grow and sell. They do a booming online business, but their physical store is such a joy to shop in, I wish they were closer to me! I purchased several plants that evening, but 'Primal Scream' is the one that is commanding attention in the garden now. 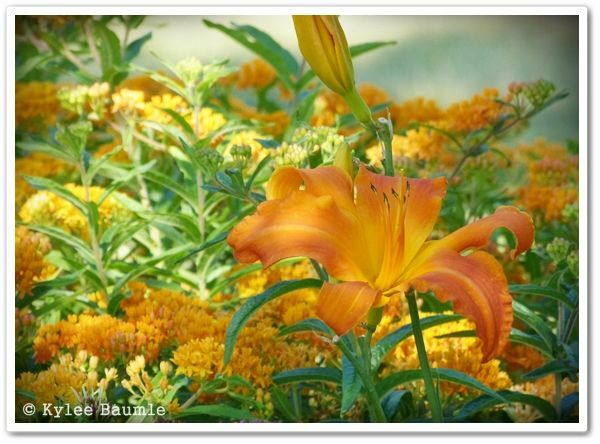 It was one of the first daylilies of the season to bloom in my garden and though I didn't plan it this way, I'm happy that I sited it by the butterfly weed (Asclepias tuberosa), because the two of them have bloomed in unison and the echo of color enhances each of them. 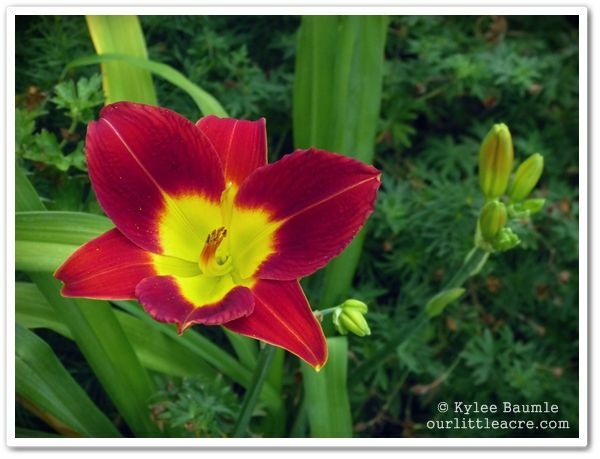 Other daylilies have been blooming like crazy all over the gardens, too and while I know some people don't like them, it's hard for me to understand this. Even though each individual bloom only lasts a day, they have so many blooms that they flower over a very long period of time. Not only that, they're scoffing at the intense prolonged heat and the drought we're experiencing. named for its hybridizer, Lana Wolfe. 'Sarah Christine', which is HUGE! blooms this year were double, but subsequent ones have not been. 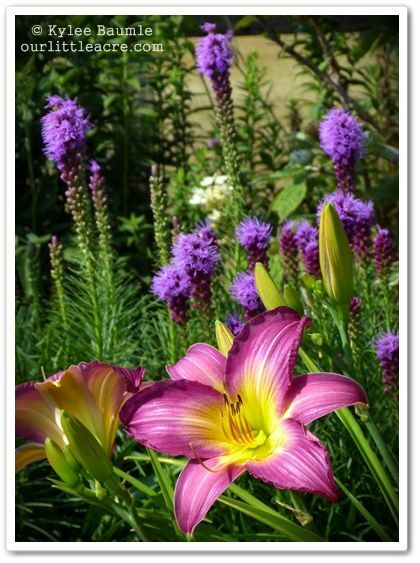 I received several daylilies from American Daylily & Perennials to trial in my gardens this summer, but they're not yet large enough to bloom. I'm looking forward to seeing them flower, especially 'Dream Souffle', a double and a rebloomer. 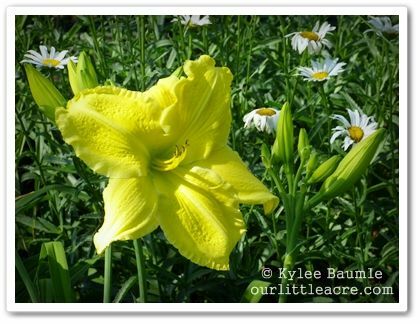 Do you have an exceptional daylily that you love? Do you have any that you wouldn't be without in your gardens? Tell me what they are, please. I might need them, too. I have to say 'Primal Scream' is fantastic! I've had it for a couple years now and it's always a beautiful performer. I think it bloomed consistently for about 2 weeks. Love siloam double classic as well! I planted some nocturnals this year but I think I'll have to wait until next year to see a bloom. 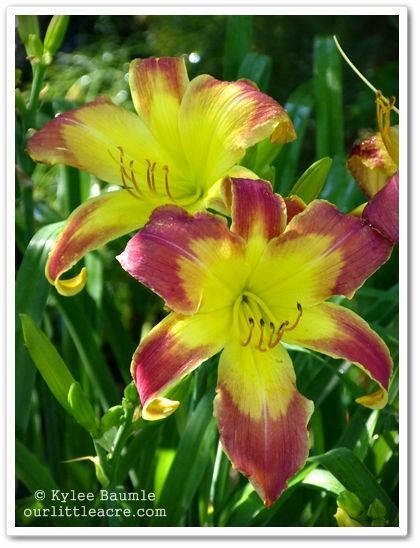 Love how heat resistant daylillies are. Most of the garden is suffering but I love the pops if color they offer and watching the buds get bigger and bigger until they open. Thanks for loving them too! I just love "Plum Perfect." 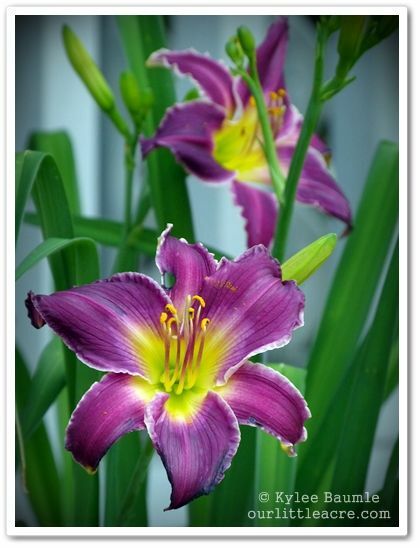 Your daylilies photos are fantastic! 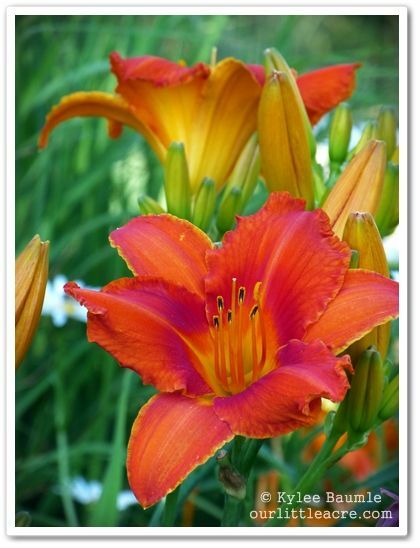 Dave ~ I'll admit, I'm not a huge fan of orange daylilies, probably because of all the ditch lilies around here, but 'Primal Scream' is just GORGEOUS. I love it and I'm very glad I bought it! NHGarden ~ Chris, thank you! And I just looked up 'Plum Perfect'. It's really pretty! Love the deep color and it's a rebloomer. Bonus! Elles sont superbes. Bonne journée. Stunning! I just love those blooms. Thanks a lot for the wonderful lilies. Nice post. I don't have a ton of varieties (yet! ), but I think Little Grapette is a champ, it blooms like CRAZY for me. I also love Sunday Gloves- huge cream colored blooms. I absolutely love Grey Witch!!! It has so many blooms it's amazing. I also have Trahylta, Modern Design, and Route 66 that some of my other favorites. I like the "Candy" line... 'Strawberry Candy' for example, they are such big, growthy plants. Also, I like Dr. Darrel Apps' "Returns" group, 'Rosy Returns', 'Happy Returns', 'Diamond Returns'; they are very easy to use in your home landscapes or in commercial landscaping. They are a lower growing group, very uniform, and beautiful color shades, and extremely long-blooming. 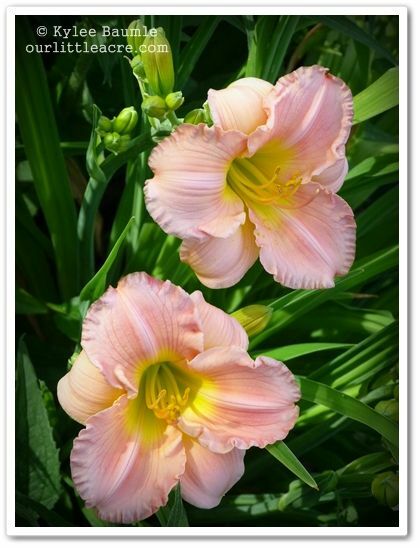 'Ice Carnival' is also very nice for its very pale yellow color, long-blooming traits. There are many more I lust for that are not readily available, if at all, and fall into more of the collectors-only club. Glycine blanche ~ Merci de visiter Our Little Acre! Jean ~ I'm glad you enjoyed them! Thank you! 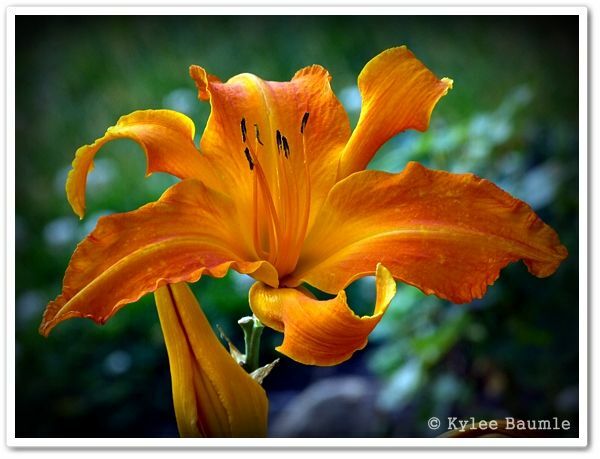 Kara ~ I've never thought of myself as a daylily lover, but the more I garden, the more I appreciate their beauty and their resilience! I've got 'Sunday Gloves' too and it just started blooming a couple of days ago. ConnieB ~ I looked those up and 'Grey Witch' is SO unique! I might have to get that one. Thanks for the suggestion! 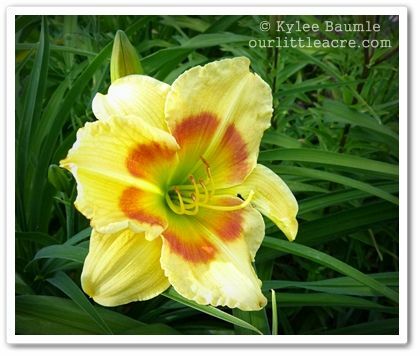 Rachelle ~ I only have 'Strawberry Candy' and I agree, a very nice and robust daylily! 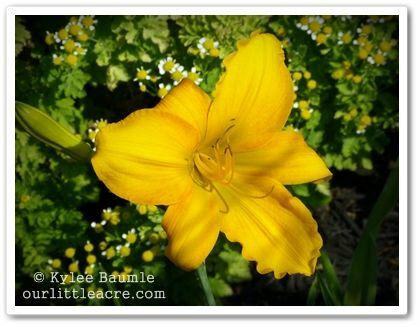 I know what you mean about Daylily lust. I've seen some that really are outstanding, with a price tag to match!